3M™ 1194 Copper Foil Shielding Tape with Non-Conductive Acrylic Adhesive | 3M 1194 | Fabrico, A Division of EIS, Inc.
2.6 Mil (total thickness) Copper Foil designed for applications requiring reliable point-to-point electrical contact, particularly EMI shielding, grounding and static charge draining. 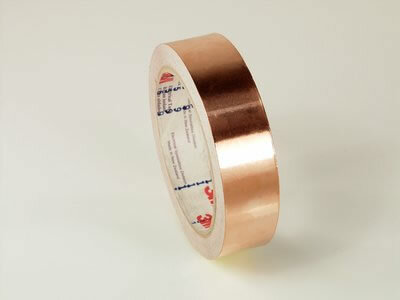 3M™ Copper Foil Shielding Tape 1194 has a 1.4-mil smooth copper foil backing with a non-conductive acrylic pressure-sensitive adhesive and liner. The non-conductive adhesive does not drain the static charge to a grounded substrate. The 1194 tape has common EMI shielding 1.4-mil thick copper foil backing. Acrylic adhesive has good resistance to heat, oxidation, solvents and oils. The tape is UL Recognized for flame retardancy per UL 510. This tape is designed for EMI/RFI shielding applications. These tapes can used in both electronic & electrical devices, connector & cable shielding, electrostatic shielding between transformer windings, and coil outer wrap. 3M 1194 Tape is typically used for applications requiring economical electrical bonding, grounding, and EMI shielding. The copper foil backing is solderable and resists oxidation and discoloration.